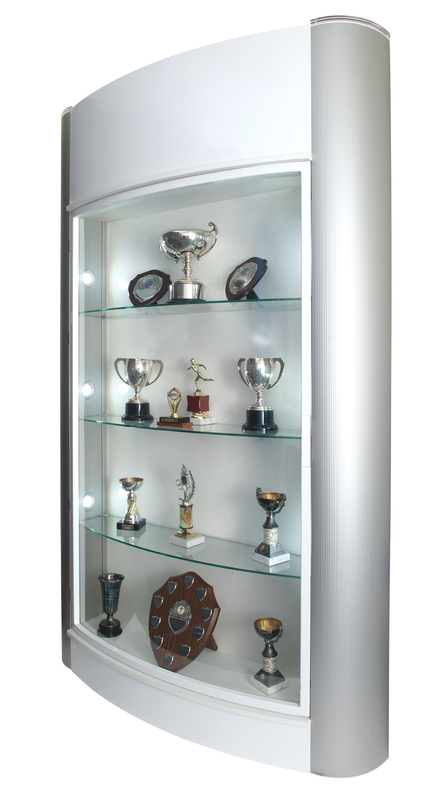 Trophy showcases are used in sports schools and schools all over the world. Mostly trophies are placed inside them and photographs of the teams that won that year. If it is a club, it is placed inside the room where they practice. However, where look great! Wood. If you decide to manufacture the wooden trophy case, it will be because it is formal. This means that they may be trophies for olympics of knowledge, classical music, etc. Aluminium. They may be personal achievements but they are just as important. In these you will be able to place all type of trophies or recognitions. Crystal. You may want to have it in an office for acknowledgements or photographs, has an executive touch. They even exist with different curves or shapes. These will always be chosen by you. But with all of this you will receive more! Remember above all it’s your satisfaction. We have a lot of options for you. As a result, you will have a great business or a great showcase! Our Tower display cases are excellent for jewelry businesses and many other retail business. To view our total line of wall upright and tower display cases, feel free to contact us. Our company has always made 2 lines of display cases. Our standard and classic lines have been extremely popular but we have recently also added our new line of economy display cases. Below are a few designs from our counter display case category. Please keep in mind that we are able to make all of our glass counter display cabinets in various sizes and colors and we are also able to customize them as well. Not all trophy display cases are manufactured equally and this is especially true when it comes to glass display cases made in China. putting the life’s of our citizens at risk in Canada and the USA. When looking to purchase a display case make sure it the important UL label. The above link is a great read and well worth your few minutes of time. The information will discuss the history of jewelry and also what exhibits and trade shows have played such an important part of this industry. Our company has been around for over 30 years and we manufactured many hundreds of exhibits and trades shows for jewelry retailers all over the USA and Canada. YES….we do make Trophy cases as well. Actually Trophy and Award showcases are among the most common project we manufacture and therefor we have LOTS of experience making them.